On December 7th at our holiday party and member appreciation celebration, both Alison Young and Don Murray were each presented with a Flathead Land Trust Conservation Leadership Award for their incredible service and dedication over many years to our organization and conservation in the Flathead Valley. Alison Young moved to the Flathead Valley in the late ‘90’s and opened the Whitefish River Inn, a B&B where she hosted many guests and weddings over the years. She has been very involved in the community including board member of Whitefish Theatre Co., FVCC board of trustees, and supportive of many organizations and causes. Alison joined the board of Flathead Land Trust in 2006 and continued serving for a full 9 years, including her last three years as president. She has continued to play an important role in planning and implementing our annual Barn Bash fundraiser. In 2013, she volunteered to serve as the organizations interim executive director for a year during a time of transition, putting in countless hours and vital leadership for the benefit of the organization until a full time executive director could be hired. She lead the organization during a time of great change and challenge, and her undaunted leadership helped FLT to be the healthy, vibrant organization it is today. Don Murray has been a lawyer for 37 years and is currently partner at Hash, O’Brien, Biby and Murray in Kalispell. He practices law in a variety of areas but has also has built a reputation with his work in water law and environmental cases. He has dedicated his time and services to many organizations including serving on the Montana Justice Foundation where he was named NW Montana pro bono attorney of the year. He has served on the boards of NW Montana and American Bar Associations and the State Bar of Montana. He also served as a trustee for the Kalispell Public School board of trustees for 17 years and according to long-time educator Ken Siderius, “Don was always looking out for our kids’ best interests”. 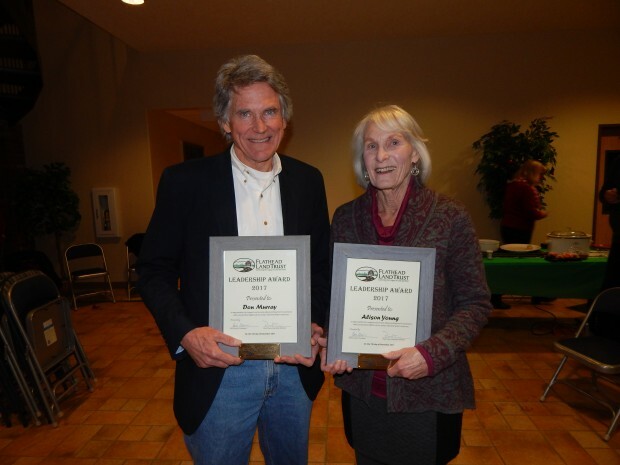 Don has been involved with Flathead Land Trust for over 30 years – pretty much since the beginning. He has served as board member, board president, and is still serving on our lands committee. He also donates considerable time and expertise as our primary legal reviewer for conservation easements. We can’t even begin to think about all of the time and effort he’s given to this organization over the years. We can’t think of two more deserving people to receive this award. We should all be very grateful for Alison and Don for their unwavering leadership, service and commitment to conserving our spectacular land and water legacy through community-based conservation.